Many business leaders believe lawsuits are an inevitable cost of doing business. This perception of litigation's inevitability is one of the most expensive and economically damaging attitudes in America today. In Verdict for the Defense, veteran mass action defense lawyer, Rob Herrington, tells company managers that costly litigation is not always an inherent part of operating. 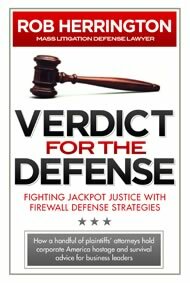 In fact, many lawsuits can be avoided with foresight, attention and planning, the core of which Rob has captured with the Defense Firewall strategies he shares in the book. Verdict for the Defense is Rob Herrington's alternative to a wait-and-see (and pay) approach. Its unique philosophy can help significantly reduce or eliminate substantial and often unnecessary expenses of litigation. As plaintiffs' lawyers scan social media and consumer-complaint websites looking for the next big case, smart business leaders are setting up Defense Firewalls to avoid the rampant Jackpot Justice targeting companies in every industry. Savvy advice from a high-stakes trial attorney.